Egypt's five-year intervention in Yemen in 1962 cannot be compared to the current Saudi-led campaign in the country, President Abdel-Fattah El-Sisi said in a speech on Saturday. El-Sisi, speaking after a meeting with the Supreme Council of the Armed Forces, addressed those sceptical about Egypt's role in the campaign, which aims to halt the Houthi rebels' advance in Yemen. "We will not harm our country and brotherly countries with wrong calculations…We are also moving in a political context to evade losses," El-Sisi said. Egypt's intervention in the Yemeni civil war ended in withdrawal in 1967. El-Sisi said that though he cared for "every drop of blood and every son of this country, our nation is in danger." The campaign began last month after President Abd Rabbou Mansour Hadi fled the country following the rebels' capture of the southern city of Aden. Egypt has sent naval and air forces to support the offensive but has not ruled out the possibility of deploying ground forces if needed. Concerns have been raised in Egypt of possible adverse repercussions on Bab El-Mandab strait which links the Red Sea to the Gulf of Aden. Any blockage to the traffic in the strait will have a direct effect on the trade in Egypt's strategic Suez Canal, one of the country's main sources of income. "El-Mandab strait is Egyptian and Arab national security," said El-Sisi, vowing to firmly challenge any possible threat to the strategic post. During the latest Arab League summit, Arab leaders approved an Egyptian proposal and agreed in principle to form a joint military force to deal with regional security threats. "Our benefit is in the security and stability of the Arab countries, and the whole world if possible," El-Sisi said. "We will not let down our brotherly Gulf countries." Oil-rich Gulf countries have pledged at least $50 billion in aid and investments to Egypt since the 2013 ouster of Islamist president Mohamed Morsi. 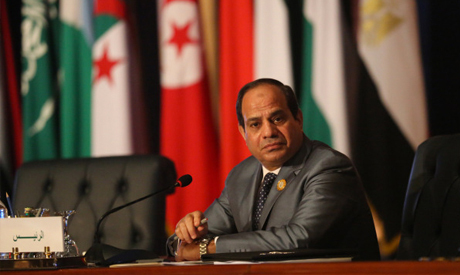 "We are not (participating in military action) to give back to the Gulf," El-Sisi said. "We would have still risen for their support and protection even if they hadn't had a chance to help." The Arab chiefs of staff held a joint meeting in the Saudi capital Riyadh on Friday to discuss the planned joint military force. Without ground troops you will gain nothing - with ground troops you will run into a desaster as coalition forces in Afghanistan. Gen.Sisi's reluctance is absolutely understandable. We need people Assembly to start our economic and national security work. President El-Sisi can not do everything. We all united. against BH of Kazabeens and other regressive forces. We should not tell our enemies what we will do or not. Egypt should pay attention to other nations like Somalia, Eretria on the other side of Red Sea straight. Sinai proved the need for major military training and education of our troops and its leaders. Tahya Misr & Oropah. Our obligations to Saudi, who injected billions of aid, should not overshadow our obligations to the 90 million Egyptians who need every dollar and ounce of energy we have to build the economy, so that we don’t have to be bullied by aid sheikhs into useless religious wars.